This watercolor painting is a companion piece to Butterfly Ballet. 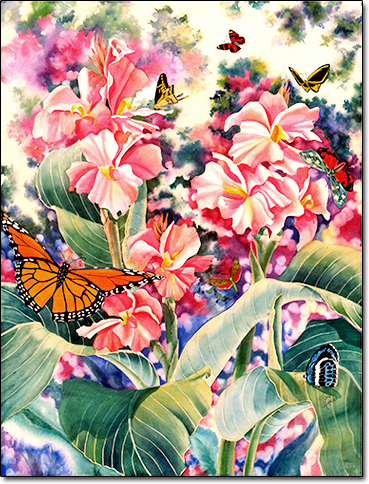 The artist notes that the butterflies fluttering around the cana flowers reminded her of ballerinas dancing on stage. This is nature's ballet. This original watercolor painting is available. It has been custom framed. The watercolor is floated on a linen backing. The image is also available as a hand-signed poster. When you make your selection, click on the Add to Cart button to finish your purchase.